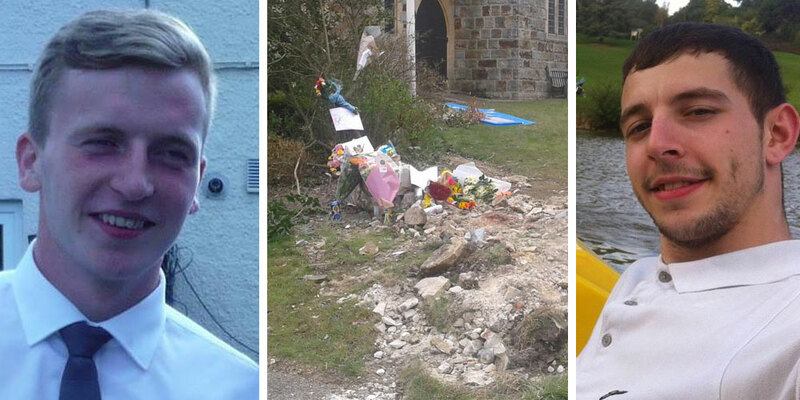 This morning the family and friends of Kyle Careford (20) and Michael Owen (21) were shown video recorded on a mobile phone in the minutes leading up to the fatal collision outside St Michael’s Church in Jarvis Brook in April. It was revealed that Police had retrieved video from an iPhone recovered from the Renault Clio after the crash. Passenger Michael Owen had used his mobile to film Kyle Careford driving at high speeds up and down the B2100 Rotherfield Road through Crowborough and Jarvis Brook. It was confirmed that Kyle was driving Michael’s Clio even though he didn’t have a driving license. On the video the young men can be seen first driving from Rotherfield on the B2100 before they turn round on the Montargis estate and come back down Crowborough Hill to Jarvis Brook and under the railway bridge. On the video Michael can be heard ‘coaching’ Kyle telling him to keep-going, change gear or change position on the road. The car’s speedo can be seen reading between 80 and 90 mph on the video. Just before car goes under the railway bridge Michael tells Kyle to “slow-down, “slow-down”. Police collision investigators who examined the crash site and the skid marks left on the carriageway, said after driving under the railway bridge, the car had spun out of control, mounted the pavement colliding with the boundary wall outside the church before being flipped onto its roof. The Clio was badly damaged including having the driver’s side and roof pushed-in. The post-mortems had shown the young men had suffered mulitple injuries in the crash and both were pronounced dead at the scene. One of the witnesses, an off-duty PCSO who lived opposite the church, had heard a car wizz past her bedroom window about three times before she heard a massive bang and looked out to see what had happened. The Inquest at Hastings Court investigating the cause of the death, heard evidence from a toxicologist who had tested blood samples for levels of alcohol and drugs. Kyle had very high-levels of a sleeping-pill zopiclone in his system as well as codeine, diazepam and cannabis. Kyle also had just below the legal limit of alcohol in his blood. It was said in the coroner’s court that the cocktail of drugs and drink would have seriously impaired his ability to drive the car safely, the excessive speed of the vehicle and his inexperience as a driver, all contributed to the cause of the crash. Collision Investigator PC Watmore told the Inquest that Michael had encouraged Kyle to drive at excessive speeds, and toxicology reports showed Michael also found had high levels of drugs in his system. Evidence from other witnesses, including a lorry driver and a taxi driver, was heard at the Inquest. They reported sightings of a small red car being driven erratically and at high speeds in parts of Crowborough earlier in the night. Another witness said she had seen a car doing hand brake turns in Beacon Academy’s car park. It wasn’t substantiated in court whether it was the Clio they had seen or similar looking car. A car is a lethal weapon and has to be driven with respect. It is understood that Kyle and Michael’s families have agreed to an edited version of the video being released to the public in due course, in the hope it will act as a deterrent to other drivers.